Best Mattress for Neck Pain: Get Rid of the Pain when Sleeping! Chronic neck pain can keep you from falling asleep, disrupt a restful night, and give you headaches as soon as you wake up. It’s a real, well, pain in the neck, and while your pillow is often the primary cause of neck pain, your mattress can have an effect as well! We’re your mattress experts, and we’ve put our researchers to the task of finding the most therapeutic beds available today for resolving neck pain. We know you don’t want to spend thousands of dollars on big box store brands, but we also know you shouldn’t have to settle for subpar budget mattresses. So, what is the best mattress for neck pain? Let’s jump in and find out. This guide will introduce you to three great cushions that will reduce your neck pain and get you resting easy. It’ll also talk you through shopping for a bed when you’re concerned about your neck. There’s something for everyone here, regardless of your budget, size, or preferred sleeping position! The primary cause of neck pain is spinal misalignment. While acute neck pain is often the result of an improperly sized pillow that places your head at an angle to the rest of your body, sleeping on the wrong mattress can also create painful curvature! Super soft beds let your torso sink into the cushion too far, creating one long curve from your hips to your head. Super firm beds do the same thing, because they don’t allow your hips or shoulders to sink in far enough. By finding a mattress that keeps your whole spine in alignment through the night, you can reduce curvature and reduce neck pain as well! So, which beds fit the bill? This Resort Sleep mattress provides a lot of bang for your buck! It’s a full 10”, but still costs well under $300 for a Queen size bed. At a medium to medium-firm comfort level, it’s ideal for both back and side sleepers who need to keep their spine aligned on a budget. Is this the bed mattress for neck pain? Let's find out in a sec. It’s a lot of mattress for the price. The Resort Sleep is 10” thick, with a 2.5” layer of comfort “visco” memory foam on the top, and 7.5” of support foam underneath. We like that the majority of the bed is on the supportive side, since that’s so important for keeping your spine straight as you sleep. It’s also one reason we like having a thicker mattress, since thinner beds don’t have as much space to devote to structural foam. This is rated as a medium to medium-firm cushion. It’s an ideal comfort level for spinal alignment, since it errs on the side of support, but still allows for some pressure relief. Most budget beds only suit one sleep position, but this will work well for almost anybody. 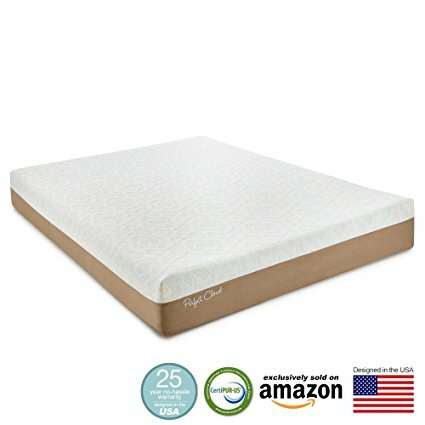 Previous buyers were extremely impressed with how well this mattress balanced pressure relief and support for the price. Reviewers with scoliosis and other chronic conditions gave it high marks, as well as folks who had experienced occasional neck pains in the past. Many buyers commented that this mattress was comfortable enough to let them sleep without tossing and turning for the whole night. Side, neck, and stomach sleepers all said their necks felt much better than they had on other beds. One other piece of feedback from reviewers was that the Resort Sleep did a great job of isolating movement, which isn’t usually true of cushions this inexpensive. The open-cell memory foam stays cooler than many budget options. 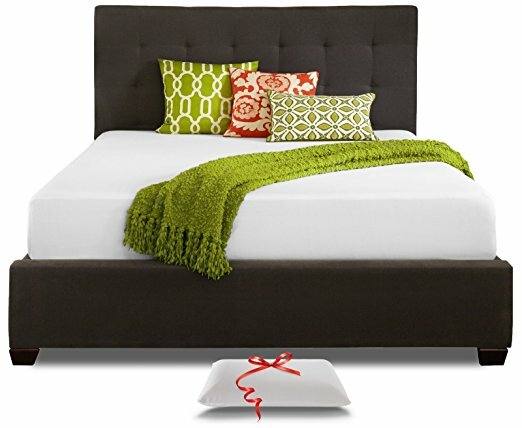 Buyers who had used older memory foam beds said they were pleasantly surprised by how cool they remained in this bed. It’s CertiPur US certified to be free of harmful chemical ingredients in the foam. Previous buyers didn’t have many complaints about off-gassing odors out of the box, and most said they were refreshingly minimal. It’s covered by a 20-year warranty, and a 30-day comfort guarantee. It even comes with a pillow! Of course, you shouldn’t buy any mattress for the pillow that comes with it, but many buyers actually complimented the pillow and said they’d be willing to purchase another! That’s not the kind of feedback you usually see for these sorts of freebies. Some buyers found that their beds didn’t expand to exactly the right dimensions. That’s something that happens occasionally with foam beds that ship rolled up, and it’s more common on budget cushions like this. Most people didn’t report any issues, but it’s something to be aware of on affordable foam mattresses. Some people found it firm at first, but most people found that after a week or so, when they had gotten used to the feeling of the foam, it adapted to their body very nicely and kept their spine in alignment. However, some folks with chronic joint pain found that it didn’t relieve pressure as well as they had hoped. It is slightly on the firm side of medium. As with many budget beds, buyers had mixed experiences as far as durability. The manufacturer has replied to those reviews saying that most of the problems with sagging are due to sleepers not using a box spring or proper bed frame supports. While some buyers agreed with that assessment, some people still thought their mattresses shouldn’t have developed soft spots so quickly. So, people ask us this question a lot, what is the bed mattress for bad necks? It's simple, we say then we show them a picture of this bed. This Perfect Cloud mattress is the same size as the Resort Sleep, but its deeper comfort foams make it even more ideal for side sleepers who experience neck pain while sleeping. It has gel-infused foams which have the responsiveness of latex without all the heat, and ventilation channels through the middle of the bed to keep you cool. There’s a smart layered design which is a lot more sophisticated than the Resort Sleep. The Perfect Cloud uses a 3” top layer of gel-infused comfort foam for pressure relief, on top of a 3” layer of air channel foam which provides ventilation as well as some extra contouring. On the bottom, there’s a 4” block of support foam, which is also cut with air channels to keep you cool. It’s the same size as the Resort Sleep, but as you can see, there are a few extra inches of comfort foam in the middle. That makes this one better for side sleepers, whose shoulders and hips need to sink in a bit further. The gel layer is denser than most memory foams, which gives it the springy quality of latex. Most buyers thought that was a big advantage over other memory foam models they’d slept on in the past. For side sleepers, that means that your torso is supported even as your shoulders and hips sink into the foam. That’s exactly what you want for neck relief and spine alignment! You don’t feel like you’re sinking, and your spine doesn’t curve downwards. Previous buyers described it as a medium level of firmness. They said you sink into the foam, but don’t feel like you’re sinking. That’s the sweet spot for keeping your neck aligned! Since it’s slightly softer than the Resort Sleep and has a deeper comfort layer on top of the support foam, it’s a better choice for side sleepers. On the other hand, many back and stomach sleepers gave it compliments as well. Most reviewers said that while it was on the soft side, it still felt supportive in all the important places. Both the gel layer and the air flow channels help keep you cool at night. Overall, this mattress has some of the most cooling features we’ve ever seen in a sleep surface! Again, that’s ideal for side sleepers, since their shoulders and hips can create heat wells. It’s CertiPur US certified, just like the Resort Sleep. It’s covered by a 25-year warranty and a 30-day comfort guarantee. It’s almost twice as expensive as the Resort Sleep, even though it doesn’t give you any extra real estate. Some buyers weren’t as impressed as others with the cooling features. While most found that they didn’t have any overheating problems, a few isolated reviewers said that they did. Some people found it too firm, even though it’s the softest of our recommendations. That’s probably because the comfort layers are gel-infused, instead of your average memory foam. Remember, our number one priority is keeping your spine aligned. If you’re the sort of person who likes to sink in completely, none of these mattresses will be for you. They’re specifically for people with neck pain. It’s pretty smelly. A fair number of buyers said they needed to air out their beds for at least 24 hours before they could sleep easily on them. Some others found the smell too overwhelming. Some reviewers received mattresses that expanded oddly, as with the Resort Sleep. That’s disappointing at this price, but of course any issues should be covered by the warranty and the return window. The Tuft & Needle mattress (and yes, there’s only one model!) is a sensation in the sleep market right now. It’s one of the most popular options out there amongst the best beds for neck pain, and it has incredibly good reviews from just about every buyer. We think its innovative design and firm sleep surface is ideal for resolving neck pain issues. The Tuft & Needle is reasonably priced, backed by excellent customer service, and built to last. It’s the best choice here for both back and side sleepers! It’s a firm mattress, but it still contours well to your body. It has incredibly good reviews from all sorts of sleepers! They loved how supportive it felt, especially people who had had problems with spinal alignment in the past. Both back and side sleepers said it contoured to their body without allowing their spin to curve unnaturally. That’s thanks to an innovative foam construction. In fact, Tuft & Needle aren’t using memory foams, latex, or any traditional urethane materials. They have a proprietary set of materials which are denser than memory foam (you can tell that from the weight–this is the heaviest mattress here by a good 10 pounds). The 3” top layer of foam is an adaptive comfort layer that works like memory foam, but without the sinking feeling and heat buildup. It has a springy quality that’s reminiscent of latex. It relieves pressure but still keeps your torso boosted. Under the top layer is a 7” support foam layer which gives you structure and keeps your spine aligned. This is the most supportive mattress here, as you can see from the fact that 70% of it is given to the support foam. Many reviewers with chronic issues like back, hip, shoulder, and neck pain all reported good results after sleeping on the Tuft & Needle. Most people said they felt like they were getting a really good hug! A mixture of charcoal and gel in the comfort layer makes the Tuft & Needle very cool, even without needing all the fancy air channels you’ll see in the Perfect Cloud. The vast majority of reviewers didn’t have any complaints about heat at all. 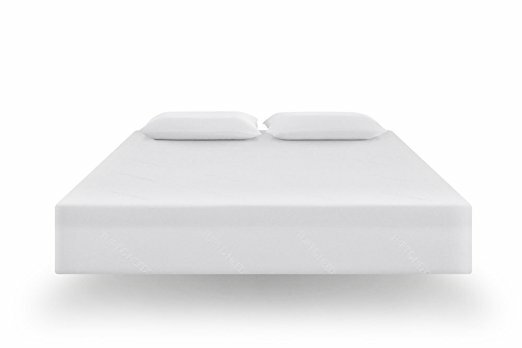 Unlike most foam mattresses, reviewers gave the Tuft & Needle high marks for side support. That doesn’t affect your sleeping experience, but it does make it easier to get out of bed in the morning without straining (which can set off chronic neck issues for many people). Even though it’s the most expensive of our recommendations, it’s still a fraction of the price of name brand mattresses. It’s the only one of these beds that’s made in the USA. As with our other recommendations, all the foams are CertiPur US certified, and the Tuft and Needle also earns OEKO-TEX ratings for its glues and fabrics. We especially like that the cushion is fireproof without any chemical flame retardants, which are hard to avoid in mattresses these days! It’s backed by a super long 100-day trial period, with free returns and no-hassle money-back guarantee. Buyers who didn’t think the mattress was quite right for them said it was refreshingly easy to send back, and the company has a very good reputation for responsiveness and helpfulness. It’s quite firm. While the latest update to the Tuft & Needle did add some added softness, it’s still on the medium-firm to firmer end of the spectrum. If you’re a lighter side sleeper, you may not find it as comfortable as other buyers. There’s only one model, and one-size-fits-all beds aren’t entirely a thing, as you know!. Some buyers found it too soft, and some found it too firm. Aside from people who just didn’t think it was the right fit for them, though, there are very few complaints about the Tuft & Needle mattress. The only issues we heard about were from a small number of reviewers who were put off by the initial chemical smell out of the box, but that’s common to all foam beds. A few reviewers also ended up with some abnormal mattresses that either developed soft spots or expanded unevenly, but the manufacturer was quick to respond. People who sleep on their backs will generally be best aligned on a medium-firm to firm bed. Back sleepers will need a slight cushion to relieve pressure on hips and shoulders, but not much. Ideally, those pressure areas will sink in slightly while your back and legs float close to the surface of the cushion. If your back sinks in too far, you’ll start to have spinal curvature that causes back and neck pain. People who sleep on their sides will need a bit softer sleep surface, with some extra depth. That’s because folks who sleep on their sides will have their hips and shoulders protruding further than they would be lying on their backs. So, the goal once again is to have a cushion that allows shoulders and hips to sink in, while supporting the torso. Side sleepers are best suited to medium-firm, medium and medium-soft beds. We don’t recommend going all the way to the soft side of the spectrum, since those mattresses can’t support your midsection properly. You need support through the middle of your body, since too much of a dip will cause a sideways C-curve, just like you’d see in a forward direction while on your back. Regardless of sleep style, you want your bed to keep your spine straight through the shoulders, so that you can get a level angle on your pillow and keep your neck safe. Temperature: do you sleep hot? If so, make sure any foam cushion you buy has either gel materials or ventilation layers to keep you cool. Cushion vs support: how much pressure relief do you need? Do you experience soreness in your back as well as your neck? Cater to your own “goldilocks zone” as long as your spine remains aligned. Warranty coverage and comfort guarantees: As with any big purchase, you want to be able to count on your bed to be a stress-free buy, and a long-lasting piece of furniture. Look for a mattress for neck and shoulder pain with at least a 30-day comfort guarantee, and a warranty lasting 10 years at minimum. Materials: We think that foam mattresses, both memory and gel foams, do the best job at keeping spinal alignment, since they adapt so easily to body contours. When you’re comparing foam models, look for Certi-Pur US certification and other eco/health labeling to assure you that your mattress has only non-toxic and harmless ingredients. Hopefully, you’re well on your way to reducing neck pain after reading this guide! You can learn more about any of the mattresses we’ve recommended on this page by clicking on the links or pictures in the corresponding review. Or, head to our homepage to see even more options! Which of these mattresses should you buy for your neck pain? The Resort Sleep is the clear choice for people who are on a tighter budget. It’s the least expensive mattress here by a few hundred dollars, and it’s a third of the price of the Tuft & Needle. It’s a really great balance between support and cushion that will help with spinal alignment for most sleepers. On the downside, it doesn’t last as long as our other recommendations, and quality control is a bit iffy. The Perfect Cloud is a good option for side sleepers who need some more cushion. It has the thickest comfort layers of the three, and it’s the plushest to sleep on. On the other hand, it may be too soft for some back sleepers, and it can be quite stinky to start with. The Tuft & Needle is our top quality recommendation for all sleepers who don’t have a tight budget to worry about. It’s still very reasonably-priced, but it’s noticeably more consistent in terms of quality control and buyer feedback than our other choices. While it’s on the firmer side, the vast majority of buyers were extremely happy with how it alleviated their neck pain. However, if you like softer mattresses, you might find it a bit too supportive.